I was just responding to an email and realized that I was sending a partner over to Amy Luby at MSPSN. I thought for a minute. Do I want to send this simple question on to her and add to her work load? I do the same thing to Erick Simpson, Erick Ligman, Vlad Mazek, Harry Brelsford, Arlin Sorenson, Dave Sobel, Stuart Selbst, and a handful of other people. Is it fair (right, just, noble) to add to their workload? After all, I know what it's like to have an overwhelming about of email to filter. - Read confusing email from staff. Inquired about the email. - Sent email to partner about troubles connecting our schedules. Proposed new time. Note: the only thing out of the ordinary here is the Facebook activity. It's my birthday, so more folks pinged me. Got back from my walk. Sixteen more items in the in-box. Including two from the people listed above. When I get a request from a partner and I don't have just the right information, should I say "I don't know" or should I pass it along if I know that someone else DOES know? Every single person in my rolodex has more work to do than they can can get done in a day (a week, a month, a year). Is it fair to pass things on to them? After all, aren't they all (you all) going through pretty much the same thing today? I decided that I WOULD forward the email. While I don't want to add to anyone else's workload, here's the way I see it. All those folks (listed above and others) have put themselves out there as community resources. Whatever tools or processes they need to filter this stuff, they WANT people like me to call on them as resources. But all these community resources are also working to make a living. And a piece of that equation is to be available for the little requests that come in over the transom. BTW: If you send an email to me and don't get an immediate response, please be patient. Some days I get busy. We have about a hundred people signed up for the big SMB Conference Call with Robin Robins on Wednesday 11/19 at 9:00 AM. I can't help myself. When I think of Robin Robins, one phrase keeps popping into my head: She's got something to teach me about marketing. The first time I met Robin was (like many of us) at SMB Nation. She gave a great presentation and everyone took lots of notes. Near the end she went into her "close." Within ten minutes she had people begging to hand over their credit cards. You know the shtick: "We only have 70 of these with us. When they're gone, they're gone." 1) I only need to get one new client EVER to pay for this. 2) I don't want to be number 71! 3) She's got something to teach me about marketing. I did a quick calculation in my head. I think I estimated $75,000 being collected in 75 minutes. Yeah, She's got something to teach me about marketing. I sometimes fly across country and don't sell enough books to pay for the airfare and hotel. I think that was 2005. I've been a Robin Robins client ever since. I've bought her Technology Marketing Toolkit, her Managed Service Toolkit, and I'm a member of one of her mastermind groups. It's all GREAT stuff. 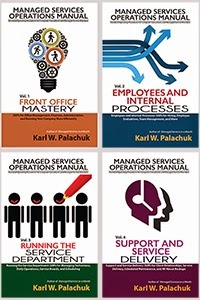 Some time after that, I was putting together a book called Service Agreements for SMB Consultants. That book comes with a CD featuring all kinds of links to resources (AutoTask, Kaseya, Exchange Defender, etc.). Before I pressed these CDs, I thought it was a good idea to contact all the people and make sure they didn't mind being mentioned. So I sent a note saying what I wanted to do and asked them whether they had any objections. I got lots of replies that basically said, "Okay with me. Thanks." But Robin sent a different reply: She wanted to know whether she could make an offer that was only good for people who bought the book. If they click on this link, they get the deal and I get a referral fee. It is interesting to me that dozens of people got the same memo. Only one of them saw the opportunity. She's got something to teach me about marketing. I think it's a bit odd that Robin always bills herself as a marketing consultant. I gain a huge value from her monthly materials as a business consultant. I look forward to her monthly mailing, especially the monthly seminars on audio CD. Still, if you've heard of Robin, you've also heard people say that her stuff just wouldn't work with "my" clients or in "my" market. Some people find her approach offensive and insulting. To which I say, "You no idea what you're talking about." To find out what Robin's response it to these comments, tune in tomorrow. Robin is my special guest tomorrow (Wed., Nov. 19, 9AM Pacific) for the SMB Conference Call. Please tune in as we talk about why her system is successful, why it's controversial, and how to make money in the tough economy ahead. In this installment we'll look at your company goals. But first, let's take a look at alternatives to doing it yourself. Matsonian posted a comment on the first part of this series, pushing his product for creating a business plan. Pure spam, but I left it because it's relevant. I've never used that product, or heard of it before. You might want to check it out. I have used Business Plan Pro, however. I'm not sure I'd endorse it. After all, it is basically a tool that interviews you and has you do some busy work. When you're done, you get a kludgy business plan, but at least you have one! If you are then motivated to learn the tool and create a more elegant plan, you can do that. The tool is not important in this process. You can do it all without a tool. But if the problem is motivation and getting started, then these tools may help. Now, let's look at goals for your company. Here's the bad news: I want you to make a commitment of 20 minutes every day until you've written down seven things . . . The most important thing about business plans is that they exist. And, to be honest, the shorter the better. If you come out of this with seven paragraphs, that would be perfect. PLEASE agree to set aside 20 minutes every morning, before you get busy with everything else, to focus on this. Sit and consider the seven sentences (or seven paragraphs) you need to create. - Write down your goals. One important conclusion to draw from all these rules: Don't do hasty goal-setting in the week between Christmas and New Years. Goal-setting is arguably the most important thing in your life, and your business. Our vision is to provide the highest quality technical support available to small and medium size businesses at a reasonable rate. We believe that profitability will follow from providing a great service at a good price. We will be honest, accurate, and professional. We will support each other in pursuit of these goals. We will not lose sight of the fact that we employ and work with human beings, and that we place a high value on positive personal relationships. This works hand in hand with many positive aspects of customer service and thereby supports our profitability. But we also acknowledge that there are times when we will sacrifice profitability to achieve and maintain positive, supportive relationships within our company and between KPEnterprises, our clients, and the larger community. Obviously, you need to come up with the values and principles that are meaningful to you and your company. There is no success in following someone else's dream. Summary: This is obviously more than one sentence or one paragraph. You don't need all this to have a great mission statement. But if you spend 20 minutes a day, you'll have a great mission statement in just a few days. All that mission statement stuff is quite ethereal. Now let's look at real world actions. What do you want to achieve in the first quarter of next year? Pick three things that are more important than anything else. They might include maintaining profitability, increasing profitability, hiring new staff, retaining all clients in a down economy, or even adding three managed service clients during the quarter. Be as specific as you can. In particular, you should be specific enough to measure whether or not you are successful. Summary: You really only need three sentences here. Many people prefer to write these goals as an affirmative statement: "We will gain three new managed service clients." Or "We will increase revenue by five percent in the quarter." In some ways, this is like the previous assignment, only easier. What three things do you want to achieve in 2009 that are more important than anything else? This is the ultimate "big picture" time. But don't get unrealistic just because you have a whole year. You still need to measure your success. Again, goals might include increasing profitability every quarter, getting 80% of labor revenue from managed service, or implementing AutoTask as your PSA system. Remember that little binder we started working on? It should now contain your financials from 2008 (we worked on this last time. With luck, you might also have some information in there for 2009 projections. Now you can add a Goals section to that. Include your mission statement, goals for 2009, and goals for Q1. Next time we'll re-examine the 2009 numbers in light of these goals. Everyone knows that I'm Robin Robins' biggest fan. Let's face it, you've HEARD of Robin Robins. Lots of people love her toolkit and her style. As they say, "Works for me." But other people don't like her approach. We'll talk to her about that approach, why it works, and why you should consider trying it. We'll also talk about the specific actions you can take in this tough economy to GROW your business. This is not the time to "survive." If you're an entrepreneur, this is the time to THRIVE. Robin has some great tips on taking advantage of the economic environment. - What is the fastest, easiest, and most reliable way to bring in profitable new clients when I don't have a lot of time, money, or staff? - How do I find the TIME to do marketing? What vendors, resources, and shortcuts are available? - What marketing methods work absolutely the best for promoting my consulting services, and which ones are just a waste of time and money? - What are the secrets to securing an above-average return on every single marketing dollar you spend? - What marketing methods are working best to sell managed services? And, of course, you can send in your questions and we'll get to them as well. Sounds like a three-hour call instead of a 60 minute call! We'll do what we can to cover it all. Again, I had a great SMB Conference Call with Dave Sobel yesterday on Virutal Environments in the SMB space. It included specific questions and answers regarding SBS 2008, and the all-important Licensing of virtual systems. My last post was Simple Little Pocket Guide to Virtual Licensing -- Desktops. Somehow, I boiled down everything you really need to know about licensing desktop VMs into a handy dandy guide you can clip out and stick in your wallet. I expect you to show me yours at the next conference. Now we're going to do the same thing with Servers! First the Caveats: I don't work for Microsoft. None of this is official. Go educate yourself. I'm not responsible for anything. You're responsible for your own actions. Car salesmen lie. Now for the meat of the matter. I believe the information presented here is accurate and that you can procede to make money with the following simple guide to licensing in the virtual environment. As with the previous post, I welcome feedback from Microsoft and I will update the post itself if necessary and not just the comments. In an attempt to keep you confused about licensing and perpetuate the belief that it's just too difficult to understand, Microsoft's Server licensing model is absolutely unrelated to the desktop model. Nothing you learned there applies here. There are two basic pieces to the server licensing model. I will refer to them as the physical server or host server and the virtual server. A physical or host server is the actual machine you can touch. Now, here's the nut you need to crack with virtual servers: You have to somehow license both the physical machine and the virtual machine. You COULD just go buy a Server 2008 license for each one and you'd be good. But, if you don't need that host machine to serve a roll outside the virtual machine (e.g., file server, web server), then it seems really expensive to buy two licenses for the simple environment diagrammed above. Microsoft's answer is: Load the O.S. on the physical server. Then only use the physical server to host virtual machines. At this point, you have "1 + 1" licensing. That means you are using one license to just run the virtual environment(s). And you can legally load the operating system again into a virtual server. Let's tweak our diagram a bit. This is the same machine, but we've noted the 1+1 feature. The really good news is that you get this licensing built right into Server 2008. Woo-hoo! There aren't many reasons to NOT use this licensing by default from now on. See Dave Sobel's discussion of this on the SMB Conference Call on Virtualization. You can also add additional virtual servers on this physical machine. You will need additional licenses for any additional servers. Sorry. You already got one freeby. Additional servers each require a separate license. Other software (e.g., Exchange, SQL) must be licensed the same as a physical machine. The only real difference between physical and virtual at this point is that you only need as many licenses in the virtual world as you have running servers. In other words, you can create 100 different virtual servers, but if 99 of them are off and you only run one at a time, then you only need licensing for that one. What about the SBS 2008 environment? Somewhere back in time (I think it was the SMB Conference Call with Jeff Middleton) I publicly announced that we are ONLY going to quote SBS 2008 Premium edition. There's just too much great flexibility with the Premium edition. If I ever had a client who needed a virtual environment, or needed a second server, I'd feel very guilty if I hadn't sold them Premium edition. So it's a guilt avoidance thing, really. SBS 2008 Premium edition includes the license for a complete Server 2008 machine. You can load the SQL or Exchange server onto that machine, if you wish. OR . . .
- Put your SBS machine into a virtual environment. You get all this licensing with the Premium edition. Important safety tip from Dave: Do not make the physical machine a part of the SBS domain. Let it be a stand-alone machine. That way, you won't have any delays as you boot it up and it looks for a domain controller (which hasn't started yet in the Virtual Environment). I hope all this makes sense. As you can see, it's a completely differnt model from desktop licensing, but it makes sense. And it's not difficult. Let's see if we can boil it down. WOW. That was shorter than I thought it would be. Had a great SMB Conference Call with Dave Sobel yesterday on Virtual Environments in the SMB space. It included specific questions and answers regarding SBS 2008, and the all-important Licensing of virtual systems. You can always download SMB Conference Calls on the SMB Conference Call Page. Click on "View and Browse Previous Calls." Or you can add the page feed into your RSS reader: http://www.greatlittlebook.com/Seminars/podcast.xml. Or connect to us on iTunes. Just look for SMB Conference Call. Any reviews you want to throw up there would be appreciated. Due to the perceived complexity of licensing, I think it is useful to boil it down for you. Caveats: I don't work for Microsoft. I don't know anything. I'm not responsible for anything. You're responsible for your own actions. Jack Ruby acted alone. Having said that, I believe the following is true and valid and that you can proceed to make money with the following simple guide to licensing in the virtual environment. I will ask folks at Microsoft to vet this information and I will update the post itself and not just the comments. Windows Desktop Operating Systems (Windows XP, Windows Vista) are sold as either an original equipment manufacturer (OEM), a full package product (FPP), or as an upgrade license (via open license). Virtual machines cannot take an OEM license. FPP is really Full Price Product and is too expensive. And the upgrade license won't work if you don't have an existing operating system. So it appears that there is no way to legally license a virtual machines. WRONG, dog breath. There are two pieces to licensing on the virtual machines (VMs). Interestingly enough, licensing is based on the machine that connects to the VM. We're going to call this the User's Machine. First, the user's machine must have a valid operating system with Software Assurance. This includes volume licensing with basic SA and open value subscription. How you acquire Software Assurance is not important for this discussion. Just be aware that some form of SA is required. Second, the user's machine must have a Vista Enterprise Centralized Desktop (VECD) license. For each machine that connects to a Virtual Machine. NOTE: In all cases, you can use "downgrade rights" to put Windows XP on the VM and on the user's machine. You can create an essentially unlimited number of virtual machines with various configurations. Each is licensed by having the correct licensing on the user's machine that connects to it. Life is just a little easier with a Thin Client. Because it won't take a full operating system (XP or Vista), the Thin Client is not required to have Software Assurance. Therefore, all you need on the Thin Client is a Vista Enterprise Centralized Desktop (VECD) license. Note: See the document "Licensing Windows Vista for Use with Virtual Machine Technologies" on the Microsoft Licensing web site. THE page to review, learn, memorize, and love is: http://www.microsoft.com/licensing/resources/volbrief.mspx. Really good information lives there. That page is literally a top-ten link for the next two years of your life. Add it to your internal sharepoint and read whatever you find there. Note: VECD and MS Desktop Optimization Kit both include the necessary VECD licenses. See? That boils down very nicely! Dave Sobel and I are geared up for a great one-hour discussion of Virtualization and Virtual Environments on Wednesday, November 5th at 9:00 AM Pacific (12N Eastern). Then, on Wed. Nov. 19th, Robin Robins joins me for a discussion about Marketing Techniques for a Tough Economy. 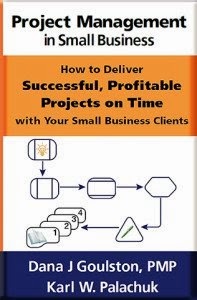 Register for both on the Great Little Book SMB Conference Call page. Dave Sobel is the CEO of EvolveTech in the Virginia/Washington DC area. Dave is also the Author of a series of great blog posts on Virtual Environments and Virtualization. See http://www.evolvetech.com/blog. In September, Dave and I put on a four-hour seminar on Designing, Implementing, and Making Money with Virtual Environments. Soon, Dave will have a book out called Virtualization: Defined, the only book on virtual environments pointed directly at the SMB consultant. Keep your eyese open for that. Now tune in as I do a live one-hour chat with Dave on this very hot technology. We'll talk to Dave about virtual environments generally, and how you can use VMs with (in, on, and around) SBS. If you're looking for something to boost your business in the year ahead, consider virtual machines and virtual servers.